Aging is a degenerative phenomenon determined by interactions between the external environment and genes. It is a complex process composed of several features: exponential increase in mortality rate with age, physiological changes that lead to functional decline with age, increased susceptibility to certain diseases with age (osteoporosis, emphysema, atherosclerosis). There are many proves that aging may be linked with a gene located on chromosome 13: KL gene. Klotho is an enzyme that in humans is encoded by the KL gene. The Klotho gene was discovered in 1997 by Dr. Makoto Kuro-o (University of Texas) in a mutated form of mice. The gene was named after a Greek goddess Klotho who spun the thread of life. Klotho gene is mainly expressed in kidneys and brain. The Klotho protein is composed of a large extracellular domain (- 130 kD), a transmembrane domain, and a very short intracellular domain (10 amino acids). The extracellular domain: it has homology to family 1 glycosidases (enzymes that hydrolyze terminal glycosidic linkages in sugars, glycoproteins, and glycolipids) and is subject to ectodomain shedding. As a result, the entire extracellular domain is released into the extracellular space and is detectable in blood, urine, and cerebrospinal fluid. Thus, the Klotho protein exists in two forms: membrane Klotho and secreted Klotho. Membrane Klotho functions as a receptor for a hormone that regulates excretion of phosphate and synthesis of active vitamin D in the kidney. Secreted Klotho functions as a humoral factor with pleiotropic activities, including suppression of growth factor signaling, suppression of oxidative stress, and regulation of ion channels and transporters. The function of membrane Klotho was not clear until we realized that Klotho-deficient mice and FGF23-deficient mice suffered identical phenotypes. The main function of FGF23 seems to be regulation of phosphate concentration in plasma. 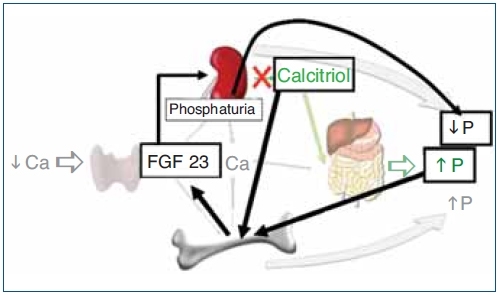 FGF23 is secreted by osteoblasts and osteoclasts in response to elevated calcitriol. FGF23 acts on kidneys, where it decreases the reabsorption and increases excretion of phosphate. Thus, FGF23 functions as a hormone that induces negative phosphate balance. When phosphate is in excess, fibroblast growh factor-23 (FGF23) is secreted from bone and acts on kidney to promote phosphate excretion into urine. FGF23 also reduces serum vitamin D levels to suppress phosphate absorption from intestine. Defects in either FGF23 or Klotho not only cause phosphate retention but also a premature-aging syndrome in mice, which can be rescued by resolving hyperphosphatemia. In addition, changes in extracellular and intracellular phosphate concentration affect glucose metabolism, insulin sensitivity, and oxidative stress in vivo and in vitro, which potentially affect aging processes. These findings suggest an unexpected link between inorganic phosphate and aging in mammals. Several laboratories have successfully rescued the aging-like phenotypes in FGF23-deficient mice and/or Klotho-deficient mice by resolving the hyperphosphatemia and/or hypervitaminosis D by means of dietary and genetic interventions. A vitamin D-deficient diet rescued many aging-like phenotypes of Klotho-deficient mice and FGF23-deficient mice. A low phosphate diet reduces blood phosphate levels and rescues mice lacking Klotho or FGF23, despite the observation that it did not reduce blood calcium or calcitriol levels. Similarly, limiting phosphate reabsorption by deleting the kidney-specific sodium-phosphate co-transporter type-2a gene reduces blood phosphate levels and rescues these mice without restoring serum calcium and calcitriol levels to normal. Thus, it is not calcitriol or calcium but phosphate that is primarily responsible for the aging-like phenotypes caused by defects in the FGF23-Klotho system. These observations indicate that phosphate retention leads to pathologies resembling aging, which may be collectively referred to as phosphatopathies. Phosphatopathies are universally observed in patients with chronic kidney disease (CKD). CKD is defined as a state of progressive decline of renal function over months/years caused by any chronic diseases that affect the kidney and/or natural aging. Since hyperphosphatemia was identified as a potent mortality risk in CKD patients, lowering blood phosphate levels below 4.5 mg/dL with a low phosphate diet and phosphate binders has been an important therapeutic goal in the management of patients with CKD. Patients with CKD exhibit a marked decrease in renal Klotho expression associated with resistance to FGF23, hyperphosphatemia, and vascular calcification, which are reminiscent of Klotho-deficient mice. Notably, the vast majority of patients with CKD die prematurely not due to renal failure, but due to early onset of common age-related diseases such as cardiovascular disease, cancer, and infection. Consequently, the spectrum of death causes in patients with CKD is similar to that of the general population. Patients with CKD also suffer many aging-like symptoms, including hypogonadism, skin atrophy, osteopenia, and cognitive impairment. Thus, CKD may be viewed as a state of accelerated aging and/or an age-related disease associated with Klotho deficiency and phosphate retention. As functional nephrons are progressively lost during the progression of CKD, each nephron is required to excrete an increasing amount of phosphate to prevent phosphate retention. This can be achieved by increasing serum levels of FGF23. However, FGF23 suppresses calcitriol synthesis in the kidney at the same time. Because adequate suppression of insulin/IGF-1 signaling pathway has been identified as an evolutionarily conserved mechanism for extending life span, the anti-aging properties of Klotho may stem partly from its ability to suppress insulin/IGF-1 signaling. In fact, transgenic mice that overexpress Klotho are long-lived and slightly resistant to insulin and IGF-1 without overt diabetes. The mechanism by which secreted Klotho suppresses insulin/IGF-1 signaling remains to be determined. Secreted Klotho inhibits Wnt signaling by directly binding to Wnt ligands and preventing them from binding to their receptors. Wnt signaling is enhanced in Klotho-deficient mice, which results in exhaustion of stem cells in highly proliferative tissues such as skin and intestine and may partly contribute to atrophy of these tissues in Klotho-deficient mice. Drawbacks in long lived mice: blood contained more insulin than that of normal mice. Klotho circulates as a hormone and binds to a cell surface receptor through which it represses autophosphorylation of receptors for insulin and insulin like growth factor1. This reduces phosphorylation of insulin receptor substrate 1 and 2 and they association with phosphoinositide 3 kinase. Klotho therefore induces insulin resistance. Klotho circulates as a hormone and binds to a cell surface receptor through which it represses autophosphorylation of receptors for insulin and insulin like growth factor1. This reduces phosphorylation of insulin receptor substrate 1 and 2 and they association with phosphoinositide 3 kinase. One possibility is that it prevents cellular lipid overload by reducing insulin-stimulated availbility of glucose. Cells rich in lipids are vulnerable to lipid-induced apoptosis. However, a Klotho-mediated reduction in the amount of intracellular lipids could increase the life of the cells. no Klotho The binding of insulin to its receptor elicits a phosphorylation cascade that results in the GLUT4 translocation to the plasma membrane and causes glucose to be pumped into the cell. Increased glucose in the cell increases the synthesis of Malonyl coA which inhibits fatty acid oxidation and provides the substrate for lipogenesis. The increase in intracellular lipids can promote apoptosis. Lipid-loaded cells are also vulnerable to other methods of apoptosis. It is probably a result of the increased production of reactive oxygen species and ceramide, together with reduced protection by the antioxidants superoxide dismutase and catalase. with Klotho The Klotho protein interferes with insulin-mediated phosphorylation which ultimately blocks the uptake of glucose and decreases the amount of malonyl coA, thereby promoting fatty acid oxidation. The lipid levels in the cell are reduced which prevents lipoapoptosis and extends the cell life. Overexpression of the Klotho gene extends lifespan. It was demonstrated in worms, flies and mice. For the study Kuro-o and his colleagues created a strain of mice where the Klotho gene was more active than in normal mice. Results: the mice with the overactive Klotho gene lived 19% to 31% longer. Klotho protects against several pathogenic processes in a FGF23-independent manner. The young healthy adults with elevated blood levels of phosphorus are more likely to have high levels of calcium in the coronary arteries than the other. Phosphorus levels are related to atherosclerosis in both animal models and in patients with advanced renal disease, but it was not yet known whether this correlation also existed in subjects with normal renal function. The levels of phosphorus are a risk factor of coronary calcification although still within the normal range: beyond the determinants of the base, this suggests that phosphorus could be used to identify young adults whose risk factors editable should be controlled and managed more aggressively. Klotho protein may protect the cardiovascular system through endothelium-derived NO production. The research could eventually lead to the development of anti-aging drugs that target the Klotho receptor. However, there's still much to learn about exactly how the Klotho gene operates before a drug will be possible.